Greetings from the State Capitol in Springfield! I’d like to give you a brief recap of legislative action during this first week of Fall Veto Session. My vision and goals reflect what I hear every day as I meet and listen to constituents. Please scroll below for updates that may be of interest to you and your family. If we haven’t met already, I hope to have the opportunity to meet you in the coming months as I attend community meetings and events throughout the district. Being a strong voice for you in Springfield is my priority. In a package of three bills, the House voted to provide the same legal protections to EMS workers as those granted to firefighters with regard to workers compensation and other labor issues. I voted YES. In cases where a local school board requests a waiver from a state mandate, and approval of the waiver could result in a property tax increase, the waiver request will have to get approval from the General Assembly (instead of current law, where the bureaucracy at the Illinois State Board of Education has the sole power to approve or deny waivers.) I voted YES to protect property taxpayers. This bill would require every Illinois public school to introduce students in 6thgrade and up to the importance of developing and applying a work ethic. I voted NO because unfunded mandates on local schools result in higher property taxes. Nothing in current law prevents individual school districts from enacting curriculum like this on their own if they choose. Decisions like this are best made at the local level, not by the state. This bill failed to receive enough votes to override the Governor’s veto, meaning it will NOT become law. This legislation requires that at least 3 of the 9 members of the Illinois State Board of Education be representative of the educator community (meaning prior experience as a teacher or school administrator). The bill also requires that of the three members of the educator community on the Board, that one each be from Cook County, the collar counties, and downstate Illinois. I voted YES. Health care is a critical issue to families here in DeKalb, Kane and Boone Counties. Illinois’ Certificate of Need (CON) program is intended to ensure public accountability surrounding health care facilities’ plans to add or discontinue services and facilities or to change ownership. Unfortunately, the current CON process is noted for being among the most restrictive in the United States, impairing our ability to ensure access to hospitals and quality health care facilities in every region of the state. This bill extends the sunset of the current CON program by 10 years – from December 31, 2019 to December 31, 2029. I voted NObecause we need to fix the flaws in the current system to better protect access to health care for everyone in Illinois, not kick the can down the road another 10 years. Known as the Lyme Disease Prevention and Protection Act, this legislation would ultimately allow physicians to prescribe more aggressive treatment for Lyme disease without the fear of disciplinary action. I voted YES. Identifying urban agricultural zones is a nationwide trend due to an interest in local food sources, farmers’ markets, transforming small parcels of vacant land into areas of production, as well as urban land’s close proximity to markets. This bill would allow municipalities to establish an urban agricultural area if they so choose. I voted YES. This legislation is intended to help streamline the determination process for long-term care patients under Medicaid and provide applicants with all necessary information for completing applications in a timely manner. I voted YES. This legislation eliminates the $5 co-pay for each non-emergency visit for medical or dental service by inmates incarcerated at an Illinois Department of Corrections or Department of Juvenile Justice facility. I voted YES. The House of Representatives will return to Springfield for the second and final week of Veto Session November 27-29. Stay tuned for updates on significant legislation that we act upon after Thanksgiving. Every young person who dreams of earning a college education deserves that opportunity, regardless of their family’s socioeconomic status or background. On Thursday the House of Representatives adopted a resolution I was proud to co-sponsor, HR 1017, affirming our shared goal to improve outcomes and make a college education more attainable for more students. HR 1017 recognizes that there are significant disparities in college degree completion rates for low-income and first generation college students and students of color at colleges and universities across the State. Today we committed on a bipartisan basis to closing statewide racial and socioeconomic degree attainment gaps and institutional achievement gaps. We’re also encouraging institutions of higher education to implement and expand existing student success efforts that have evidence of improving educational outcomes for low-income and first generation college students and students of color. One example of a tremendous success story is right here in our community – the McKinley “Deacon” Davis CHANCE Program at Northern Illinois University, celebrating their 50thanniversary this year. After 50 years of service to student on NIU campus, with more than 15,000 alumni, the McKinley “Deacon” Davis Program stands as one of a few programs of its kind in the state offering access to higher education. Shaped and created from the vision of President Rhoten Smith, a champion of equal opportunity and social justice and McKinley “Deacon” Davis, once a Harlem Globetrotter in 1968. If you are having difficulty paying your utility bills, help might be available. ComEd and Nicor offer a variety of assistance programs. Click on the links below to learn more and find out if you qualify. 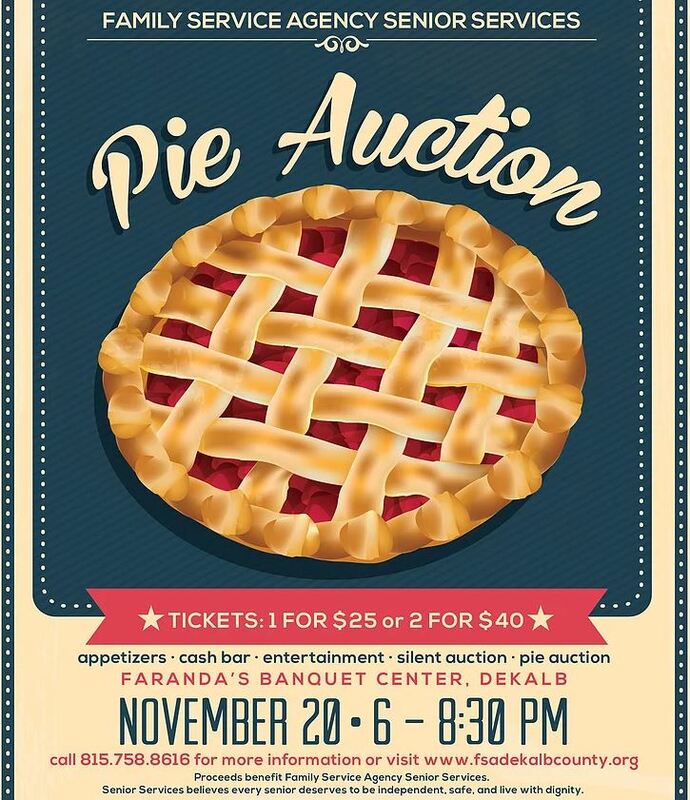 Don’t miss the Senior Pie Auction on November 20 to benefit the Family Service Agency of DeKalb County! The event will be held at Faranda’s Banquet Center, 302 Grove Street in DeKalb on Tuesday, November 20 from 6:00pm – 8:30pm. One ticket for $25 or two tickets for $40. Appetizers, cash bar, entertainment, silent auction and pie auction. For more information please call (815) 758-8616. Goodfellows is a local organization that provides Christmas gifts to children in need every Christmas. Over 98% of all money raised is spent on gifts for children in Sycamore and DeKalb. Goodfellows has been around for over 80 years, and have served over 10,000 children. Goodfellows is hosting their annual Christmas party on Thursday December 6, 2018 from 5pm to midnight at PJ’s Courthouse Tavern in Sycamore, located at 202 W State Street. The Christmas party will feature live music, food, and live raffles. $10 admission. Mark your calendars and support this outstanding organization while enjoying an evening of fun!